Earlier today we celebrated Sasha’s second birthday. I was pleasantly surprised by the amount of fun I had at a child’s party. Turns out toys are fun for grown ups too. I have to tell you I am incredibly proud of myself for not breaking my sugar-free/gluten-free fast. Turning down the birthday cake was a lot easier with a gluten-free buddy, and I discovered that another party goer was in the process of eliminating gluten to test for intolerance. We both agreed that snacks and breakfast are the toughest meals of the day. She’s tackling the situation the way I did the first time I eliminated gluten, by replacing her usual foods with gluten-free versions. Although that works it is very expensive; a small loaf of bread is anywhere from 5 to 7 dollars in Montreal. This time I decided to tackle the situation by actually changing the way I eat. Gluten free bread is a poor substitute for the real thing, so I see no point in eating it. The question then becomes, what to eat for breakfast? This meal is one of my solutions. I was inspired by Janice’s Bistro Style Egg Sandwich, but replaced the English muffin with oven baked home fries. This breakfast is great for a Saturday morning. It’s filling and delicious and pretty easy to make if you have a little time. I used a poach pod to poach my egg as none of the traditional methods ever work for me. 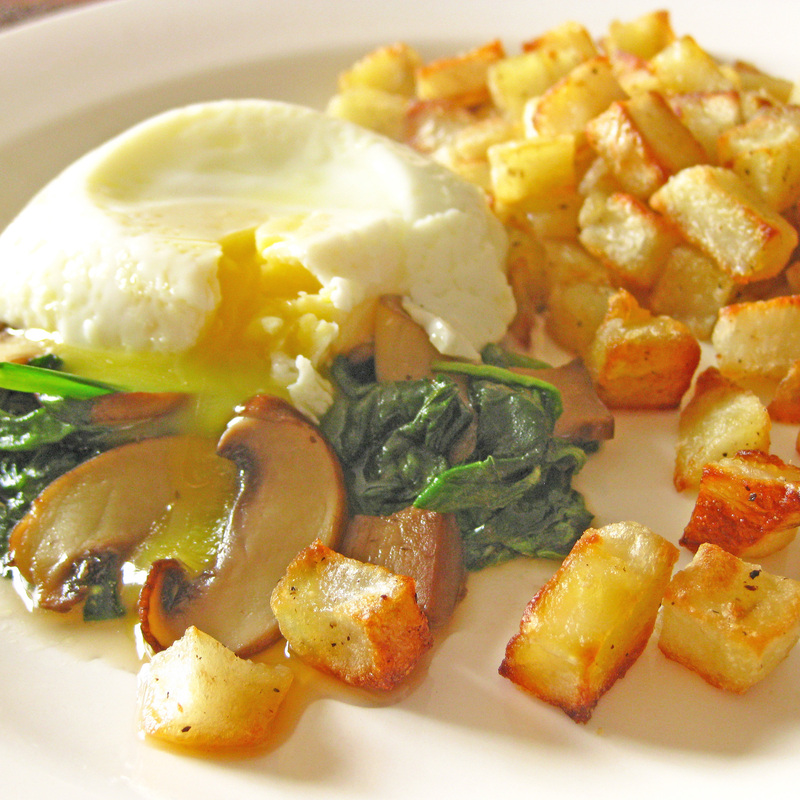 Poached Eggs With sautéed Spinach and Mushrooms and Home Fries. Slice the potatoes in half and peel them. Boil the potatoes in salted water for 10 minutes. Potatoes should be slightly less than cooked through. Toss the chilled potatoes with olive oil to coat and salt and pepper to taste. Bake for 20- 30 minutes, flipping the potatoes at least twice so that the are properly browned. Heat some olive oil in a skillet. Cook the sliced mushrooms until browned. Crack an egg into a lightly greased poach pod. Fill a medium pot with about 2 inches of water. Heat until simmering. Gently place the poach pod in the simmering water. Lower the heat to maintain a simmer and cover. Cook the eggs for 4 to 7 minutes, depending on the desired doneness (that might not be a word). Place the spinach and potatoes on a plate, and top the spinach with the poached egg. Season with salt and pepper. < Previous Daring Bakers Go Nuts for Doughnuts! That breakfast looks divine! I can’t imagine how hard it is not to be able to eat bread. One of my favorite things ever… Great post! This breakfast idea was great, I’m starting a diet and the most difficult part of diets for me is not eating bread. I’m a bread addicted. I loved the baked home fry idea. It looks beautiful and must be very yummy. Wonderful healthy breakfast! I love poached eggs but never have time during the week to make them. This is a lovely weekend breakfast for me! That is a wonderful breakfast. I have eggs for breakfast almost every morning because of having to be low carb. But there are also a lot of great gluten free treats to be made using nut flours and coconut flour, etc. If you want any ideas, I have lots on my blog! Thanks! I’m heading over there right now! That breakfast looks so good, and pretty good for you, too. I love the speckled egg. 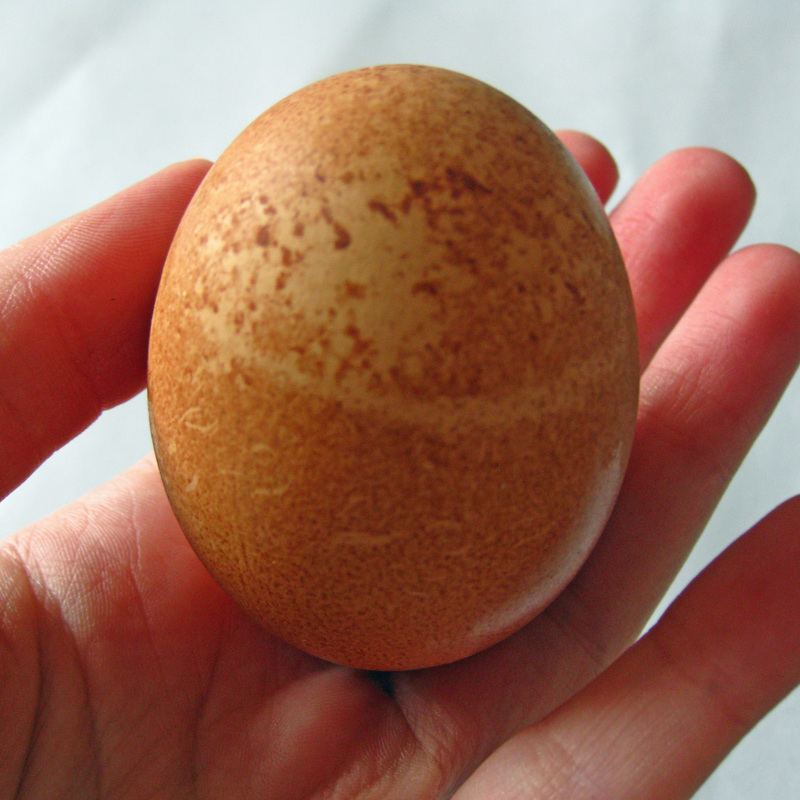 Why do brown eggs taste better? Mmmm! The egg and greens sound delicious! Your breakfast is beautiful. I love the photos and really wish I had some of your delicious meal right now! Looks like a delicious solution! This breakfast looks great! I’ve done some reading here and there on gluten, but I still don’t get what it is! I guess I know what it isn’t.. but I still don’t get what exactly it is. It has something to do with processed wheat? It’s a protein in all wheat products and a few other grains like bulgur and barely. People with Celiac are allergic to it, and some people are intolerant. For people who are intolerant it can cause all kinds of problems, mostly digestive. I’m not intolerant, but I find it a lot easier to watch what I eat by eliminating it. That I have to make all my own food. This definitely looks like a breakfast I wouldn’t mind waking up to. Love the potatoes! I’m such a fan of breakfast foods! this breakfast looks so good!